Wire decking improves ventilation and reduces dust build-up. Designed specifically for this product, wire mesh decking fits perfectly on top of beams. Waterfall design of wire mesh curves over top of beams to provide smooth shelf surface. Color: Gray. 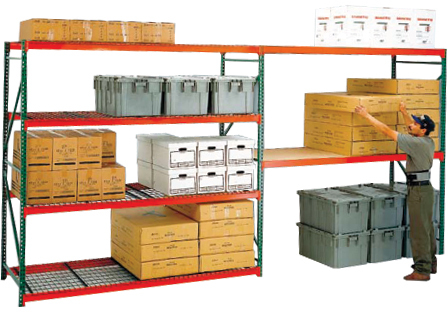 Wire decking is a makes a great, high capacity, shelving surface. When using particle board decking you will also need shelving safety supports.